PTCL has introduced a new internet device that they are calling “PTCL CarFi”. PTCL CarFi can be plugged into any car without any hassle. It promises seamless high-speed internet while on the roads in over 250 cities across Pakistan. This cigar-shaped device can become instant hot-spot by just plugging it directly into the cigarette lighter port. Once plugged in, up to five devices can connect to secure hot-spot to get high-speed internet. Furthermore, the device can also be connected directly to a PC/Laptop as the device package includes a two-way male USB cable. If connected to a PC/Laptop, the device is able to connect a total of 6 users to the internet (1 through USB + 5 through WiFi). The device is available with 2 options listed below. Both bundle prices include the Device. Much cheaper than their Charji and has free social media. Is there any 4G that provides free social media in 500 rupees for whole month? 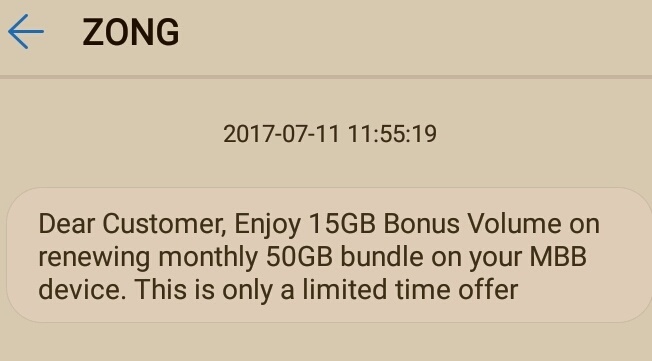 They give everymonth on activation. Check screen shot. Aap ki Maths ko salam. Is 50+14 = 75 ? Huwaei Ne 2015 Main CarFi Introduce Kiya tha :. Its not a copy-cat. They are using the Huawei device. This was a great video, bilal. I don’t know if I’ll need CarFi because Mobile Sims Already 4g de rahi hain. But From your Video, I Got to know about this. ProPakistani Should think about making more videos because lets be frank, nobody likes to read nowadays. What are the monthly charges for it ? Welli Awaam… Kuch Din Baad Commode-Fi Bhi Aajayega For Washroom. Chiri Baba wifi is the next big thing. I don’t understand who are they fooling? Even with this device, the same EVO network of PTCL is being used which is useless! and I also wonder how PTCL claims to sell 3G/4G devices when they don’t even have a WLL 3G/4G license. CDMA maybe.. but not 3G and/or 4G. Also this device is going to be the same as USB EVO or its variants and performance will be either the same or worse!. They should focus on QOS improvement first. 4000rs pe 15Gb only…we even play dota here, while driving, in the middle of desert…with 20mb speed for 240SAR (around 6000rs) that too “real” unlimited. iska matlb agar karachi me in koi hd song download py lagai to sukkur tak download ho jyega. PTCL needs to get it together but you have to give credit where it’s due. will beneficial for Uber & Careem Drivers…. device to launch kr d internet bhi thek kar dete to acha hota, free lance bhi nai kar sakte abh to.